Nitroaromatic and nitroamine compounds in munitions constituents are susceptible to rapid degradation under alkaline (i.e., basic, high pH) environmental conditions. Alkaline degradation of the secondary explosives TNT and RDX have been examined in laboratory-scale studies and field-scale demonstrations. Both topical and deeper soil-mixed applications of alkaline substances, such as hydrated lime and caustic soda, have successfully degraded munitions constituents in highly contaminated soils on training ranges and at formerly used defense sites (FUDS). Alkaline hydrolysis reactions involve the aqueous interaction of added OH- ions with dissolved organic compounds. Degradation of nitroaromatics (i.e., TNT and DNT) is hypothesized to occur through formation of a Meisenheimer complex or TNT anion. Initial denitration of nitroamines (i.e., RDX, HMX, and CL-20) by OH- is thought to cause molecular instability leading to ring cleavage, followed by spontaneous decomposition . This degradation pathway is supported by observations of nitrite and formate production during the alkaline decomposition of nitramines. The terminal degradation products of alkaline hydrolysis are commonly formate, formaldehyde, nitrate, nitrite, and nitrous oxide. At pH greater than 11, TNT degrades readily to formate and nitrate, but at lower pH it tends to polymerize. Propellant residues have been studied less than secondary explosives, but studies have shown the insoluble nitrocellulose matrix in some propellants to be rendered biodegradable under alkaline conditions. Ultimately, alkaline material is neutralized over time by the natural buffering capacity of soil. Degradation rates by alkaline hydrolysis for major secondary explosive compounds in aqueous systems have been measured under a range of pHs and temperatures (Table 1). Reported half-lives of TNT ranged from about 2-6 hours at pH 12 to up to six days at pH 11 in stirred aqueous reactors. Hydrolysis of RDX is reported to also occur with half-lives on the order of hours, with a strong dependence on temperature. HMX reacted more slowly with a reaction rate two orders of magnitude slower than that observed for RDX. Alkaline hydrolysis of the caged nitroamine CL-20 had an observed half-life of roughly one hour in pH 10 solution and on the order of minutes at higher pH. Alkaline material is neutralized over time by the natural buffering capacity of the soil. Protons (H+) exchanged from low pH soils and metal cations interact with hydroxide (OH-) ions to mitigate the alkaline degradation of munitions constituents. Furthermore, hydrogen ions associated with various functional groups in humic matter may also dissociate under elevated pH conditions and likewise inhibit alkaline hydrolysis of the explosive contaminants. Soil chemistry therefore plays an important role in energetics remediation through alkaline hydrolysis. Soil microcosm studies with 5% w/w calcium hydroxide and 50% w/w water observed half-lives for TNT, RDX, and HMX on the order of a day to a week, with degradation rates following the sequence of TNT > RDX > HMX, similar to the aqueous studies. Soil slurries using 2,4-DNT and the single amino substituted TNT degradation products (4A-2,6-DNT and 2A-4,6-DNT) also exhibited day to week-long half-lives at pH 11 and 12. A meso-scale soil treatability study was conducted using soils collected from two different hand grenade ranges. These soils were treated with a well-mixed application of hydrated lime, and migration of RDX was monitored by analyzing porewater concentrations in installed lysimeters over time (Figure 1). Overall, the reduction in RDX leaving the mesocosms as both leachate and runoff was greater than 90% with application of hydrated lime. The study authors also observed that alkaline amendments were able to fix metals contamination in place on hand grenade range soils. Figure 2. Mean pore water RDX concentrations by hand grenade bay and lysimeter with maximum and minimum concentration profiles (avg, n ranges from 7 to 10; modified from Larson et al., 2007). Alkaline hydrolysis was successfully employed at a hand grenade range that experiences ~55,000 hand grenade detonations each year. During this demonstration, initial soil samples were collected from individual grenade bays and lysimeters were installed to a depth of 5 feet below ground surface. 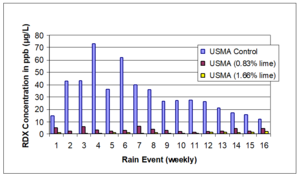 Lime was applied in December, 2005, April, 2006, and January, 2007, with nine discrete sampling events occurring between December, 2005, and March, 2007. 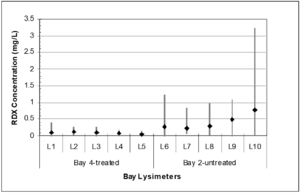 Lysimeter concentrations are shown in Figure 2 for one treated grenade bay and another untreated control bay. Based on the average pore water concentration in the treated and untreated bays over the demonstration period, there was a 77% reduction in RDX concentration in pore water from the treated bay. There is a statistically significant difference between the explosives concentration in the pore water from the untreated vs. the limed bays (P < 0.001). A project has been funded beginning in FY19 to re-examine liming practices at this hand grenade range and produce a report on the long term efficacy of this management technique for an active training range. Ex-situ alkaline hydrolysis was used at an ammunition plant to remediate surface soil (0 to 20 feet below ground surface) that had high concentrations of DNT and TNT. Laboratory experiments on this soil demonstrated that target nitroaromatic compounds could be reduced to less than 10 mg/kg within a week. The only final product of note was nitrite, which could be destroyed via a denitrification process if necessary. 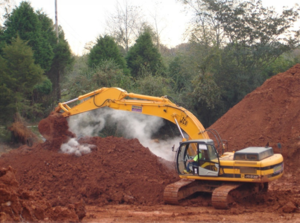 Over a two-year period, approximately 150,000 tons of impacted soils were treated and approximately 148,000 lbs of nitroaromatic compounds destroyed, with an average contaminant mass reduction of 96 percent. Subsequent in-situ treatment was used to remediate over 15,000 additional tons of soil. Figure 3. Soil mixing during ex situ alkaline treatment of soils at an ammunition plant. The basic ex-situ treatment process involved the excavation of contaminated soil to a lined basin onsite. A typical excavation is shown in Figure 3. Caustic reagents in pellet form were added at a one to two percent weight by weight basis (depending on the starting concentrations, starting pH, and the buffering capacity) along with small quantities of metal catalyst, if needed. The soil was treated in 300 cubic yard batches, with amended chemicals thoroughly mixed into the soil using conventional equipment. Water was added as needed to increase the moisture content to near saturation. Mixing was repeated two to three times a week and samples were collected for moisture content and pH, which are critical field monitoring and effectiveness parameters. After one week, soil sampling was performed per site specific sampling protocol and analyzed for contaminants of concern, daughter products, and breakdown products. If needed for soil with higher concentrations of explosives, caustic reagent was supplemented to maintain the pH at the 13.0 unit level. Soil continued to be treated until TNT and DNT concentrations were below cleanup levels (57 mg/kg for TNT and 25.4 mg/kg for total DNTs). Metals were also analyzed periodically and TCLP tests were performed per site treatment goals. When needed on a small percentage of batches, denitrification of soil was performed to lower the nitrite end-product using citric acid as the pH reducer and carbon substrate. After complete treatment, the soil was transported back to the excavation. In-situ treatment is performed in a similar way to ex-situ treatment using conventional equipment and prescribed quantities of chemical reagents. Some general heuristic guidelines are summarized in Figure 4. 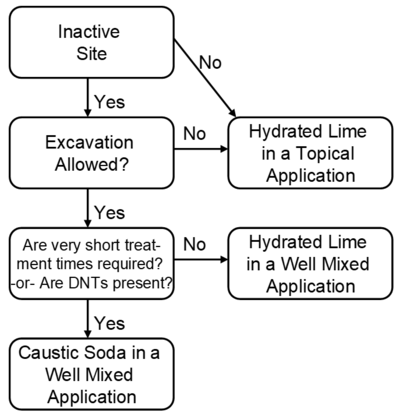 An active firing range requires treatment technologies that have minimal soil disturbance, requiring topical application of hydrated lime for most range applications. Therefore the fate of hydroxide (OH-) ions during transport through the soil is an important aspect of this proposed remediation technology. Studies performed by the agricultural and oil industries provide evidence of the transport limitations of hydroxide ions in soils, particularly in those soils with significant clay content . Figure 4. General heuristics for determining application of alkaline amendments for the management of munitions constituents in soil. This page was last edited on 31 January 2019, at 20:40.